This web page provides files of water-level data used for the maps of water-level changes in the High Plains aquifer for the eight states that overly the aquifer. Only static water levels are used in the maps of water-level change. 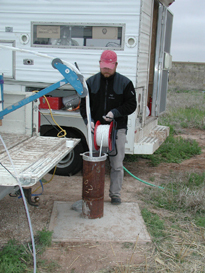 Static water levels generally are collected in winter or early spring, when irrigation wells typically are not pumping and water levels generally have recovered from pumping during the previous irrigation season. However, a fall water level is used if the fall measurement represents static conditions and it is the only available water level for the well. The data files are tab-delimited; you will need to unzip each downloaded file before you can use the data files.